Home / -Touring- / Joan Baez / Preview / Touring / Joan Baez Announces U.K. Release Date For Album "Whistle Down the Wind"; Nothing Yet For the U.S.
Joan Baez Announces U.K. Release Date For Album "Whistle Down the Wind"; Nothing Yet For the U.S.
We've talked many times about how veteran artists are far more appreciated in Europe then they are in the U.S. but, so far, we haven't seen it hurting release dates in many cases. 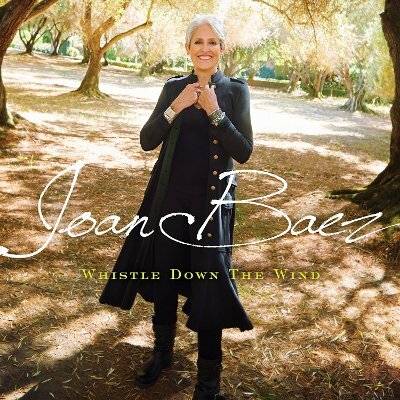 That's why it is surprising that Joan Baez has announced a March 2 release for her new album, Whistle Down the Wind, in Britain but is yet to say when it will come out in her own U.S.
Whistle Down the Wind is Baez' 25th studio album and her first in ten years going back to Day After Tomorrow (2008). The album is being released to coincide with her European tour which also starts March 2 in Stockholm and currently runs through August 3. Known as the "Fare Thee Well Tour", it reflects the original name for the Whistle album which she had said would be her last album, and also indicates her final tour. Baez said "While 2018 will be my last year of formal extended touring, I’m looking forward to being on the road with a beautiful new album about which I am truly proud. I welcome the opportunity to share this new music as well as longtime favorites with my audiences around the world."